I have dealt with Craig at Crawfords for over 15 years now. Why? 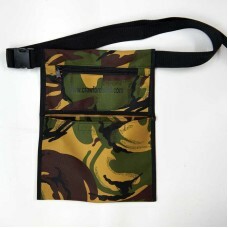 Because I get sound advice and grea..
Our own camouflage version of our ever popular blue multi-pocket finds pouch. The pouch is made from tough 800 denier polyester and measures approx 35cm x 27cm. There are 5 pockets of varying sizes to safely store all your metal detecting bits and pieces while you are out in the field. Features a 4cm adjustable belt strap with quick release buckle to fit most sizes.